How Yom Kippur Fasts Became All About The Feasts : The Salt The Jewish holiday of reflection and hope tends to bring everyone to the heaping table of traditional foods when fasting is over, But celebrating with a huge feast was not always the case. Yom Kippur break fasts are notoriously epic — all manner of smoked fishes and delicate pastries are piled high on the best china (or, if you're feeding dozens, paper plates). For many of those gathered around a table heaped with traditional Eastern European delicacies, engaging in the holiday meal is a way to connect with their Jewish roots. On Yom Kippur — which begins Friday night — over half of American Jews will fast (according to a recent survey). Whether in temple or at their workday desk, many will use the opportunity to reflect on their individual and collective actions over the past year, and their hope for the coming year. After the sun sets, they'll break their fast. And a lot of people will really break their fast. "The typical assort is a couple different kinds of smoked salmon, whitefish, herring, cream cheese," explains Niki Russ Federman, whose New York-based family "appetizing shop" (a traditional store that sells both fish and dairy), Russ & Daughters, has been supplying these foods for more than 100 years. "Whitefish salad, egg salad, some pickles. Then you get all the breads, the sweets like babka —you can't have break fast without babka!" she says. The high holidays — Yom Kippur, and the preceding New Year, Rosh Hashanah — are the busiest times of year for the shop. Federman estimates that they sell 2,000 dozen house-baked bagels, and they hand-slice about 8,000 pounds of smoked fish. "It is the great equalizer for Jews," jokes Federman. "Whether you're very observant or not, people come together around the break fast." But according to University of Rochester religion professor Nora Rubel, there's one problem with this idea of celebrating around a laden table: For Jews of Eastern European background, the table-groaning Yom Kippur break fast feast is a relatively recent development. Rubel looked into the history of the break fast, and found that, with a few minor exceptions, Jewish cookbooks of the past century didn't feature Yom Kippur break fast menus until the '80s or '90s. At most, early cookbooks would make passing acknowledgements of light meals, maybe some herring or honey cake — if they mentioned the holiday at all. Rubel theorizes that the break fast may have been minor, because the real food was just around the corner — during Sukkot, the Jewish harvest festival. "Sukkot, which comes four days after, is all about feasting. You're supposed to eat in the sukkah [ceremonial hut], and people are constantly inviting you over." But over time, the week-long Sukkot observance diminished. Rubel notes that the holiday has a few strikes against it. Its observance requires purchasing perishable produce and constructing an outdoor shed — as opposed to utilizing more manageable things like candlesticks or Seder plates, which can be re-used every year. Not only have the celebratory meals of Sukkot faded from favor, the meaning and practice of Yom Kippur itself has also changed. 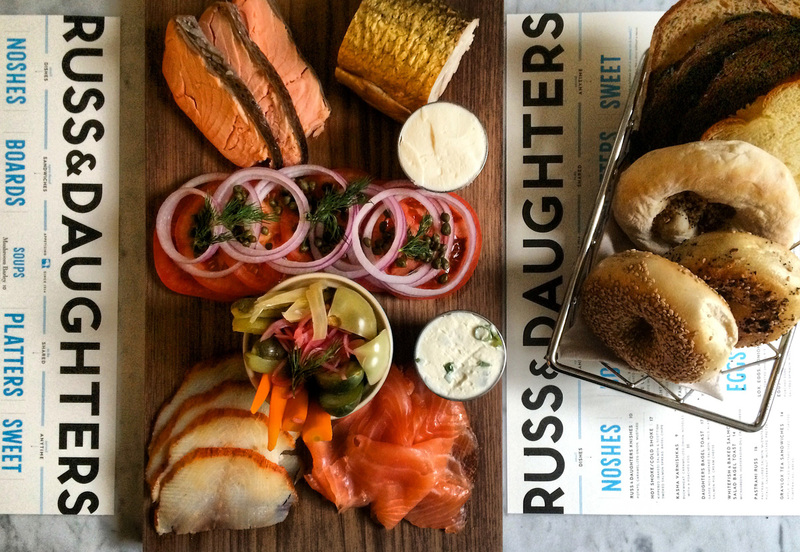 Bagels and lox from New York-based "appetizing shop" Russ & Daughters. "Especially when people aren't engaging in other parts of the practice, bagels and lox get elevated to something ritually symbolic. It's a lot of power to put on a bagel," says Leah Koenig, author of Little Book of Jewish Appetizers. Rubel says that the Yom Kippur fast is "a period of feeling 'in it' with everybody. But a lot of people don't like going to services, because it's long and it's boring and you're hungry. And also alienating, if it's not something you do on a regular basis." According to Rubel, the break fast makes the holiday more like other Jewish holidays, which tend to be food-centered. "And being with people. Judaism has never been a monastic religion," she laughs. "The major important prayers, you have to have ten people." Judaism is a religion practiced in congregation — and at the table. "There is a sacred power to food that gets layered onto it," acknowledges Leah Koenig, author of Little Book of Jewish Appetizers. "Especially when people aren't engaging in other parts of the practice. 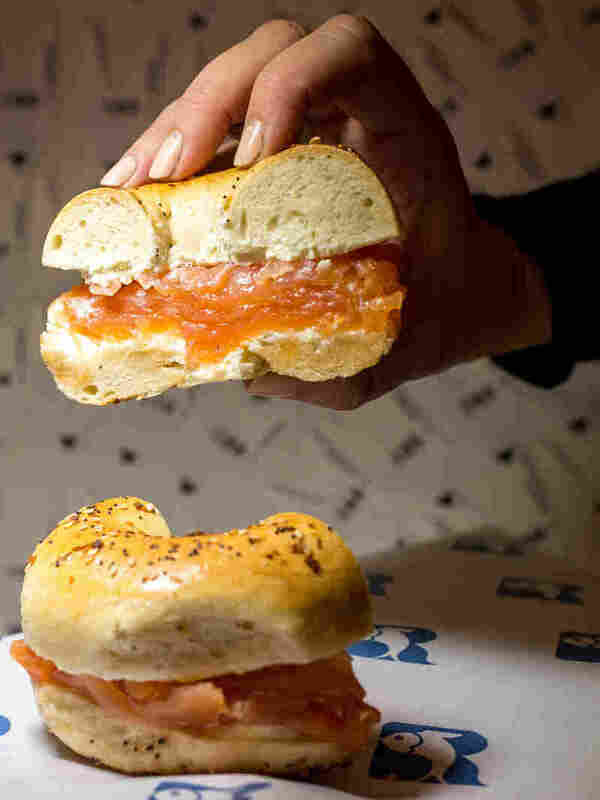 Bagels and lox get elevated to something ritually symbolic. It's a lot of power to put on a bagel." Koenig says a lot of break fasts focus on dairy-heavy dishes, pastries and smoked fishes. These rich brunch items can easily be made or assembled in advance, and satisfy a hunger for nostalgia, family and meaning — as well as missed fats and carbs. At Russ & Daughters, fourth-generation owner Federman says that people start lining up on the sidewalk outside the shop at 5:30 in the morning the day before Yom Kippur. Sure, there are the people who forgot to call in their orders in advance. But Federman says that for some patrons, standing in line for a few hours is decidedly a choice. "Being with people, buying their fish, selecting their babka — for them, this is how they feel Jewish," Federman says. It's likely that some of those stocking up for break fast will be sitting at their desks the next day instead of at temple. But as they line the block, waiting for their whitefish, they can have their own moments of spiritual reflection, and feel a sense of connection with those around them who are doing the same. Then, when break fast comes, they'll have one hell of a spread.